I recently participated in two events supporting Ethereum; EDCON in Paris, and the launch of the Enterprise Ethereum Alliance in Brooklyn, NY. EDCON, the Ethereum European Developers Education Conference was held in Paris on February 17-18 was Edcon. There, I presented on the State of the Ethereum Ecosystem. At EDCON, I estimated the total number of people involved in the Ethereum ecosystem to be 100 times the number of EDCON attendees that numbered 380. That puts it at 35-40,000, including 20-25,000 developers. I also observed that 80% of ICOs were based on Ethereum, providing Ethereum with incredible network effects in this category. The Ethereum ecosystem is so large and diverse that it has become challenging to stay updated on new initiatives or startups that enter the market, and are based on Ethereum. This is why I created EthereumAll.com, a global directory of everything related to Ethereum. If you are involved in Ethereum, you can add your entry, or claim your listing if it already exists. EthereumAll is in alpha/beta stage, and not entirely polished. As we add more companies to it, it will be further publicized later. I knew about the Enterprise Ethereum Alliance for a few months, and Feb 28th marked its official launch into the market. 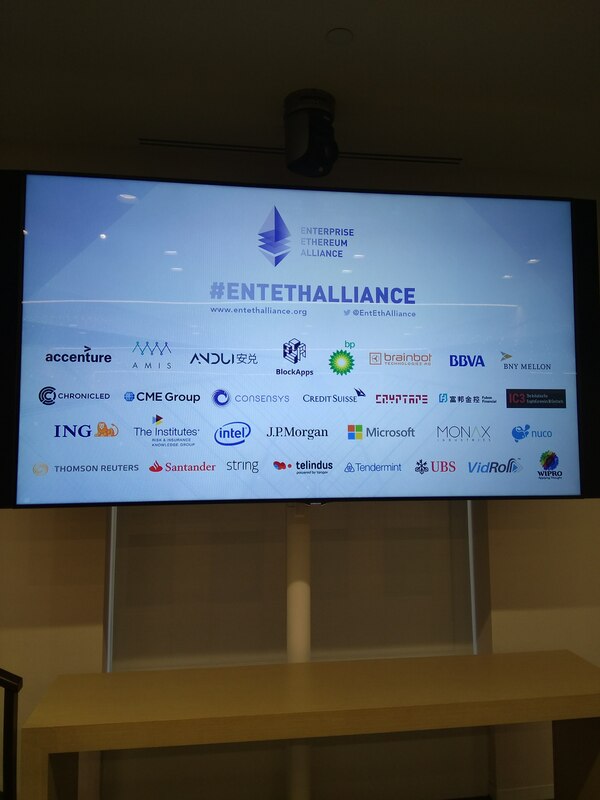 The Enterprise Ethereum Alliance includes 30 technology companies and large organizations who are committed to working together to advance the enterprise-grade capabilities of the Ethereum technology in the areas of standards, reference architecture, best practices and collaborative efforts. It is an idea whose time has come, and it hits the ground running on many levels because several of the member organizations were already working together informally anyways. I was impressed by the full day agenda that the EEA put together last week in Brooklyn at a JP Morgan facility that is part of the MetroTech mega complex. This wasn’t a PR event. There was a lot of meat on the bones of the announcement. a working demo with nodes including financial regulators, and where only counterparties see transactions and regulators see all of them, kind of similar to how the system works today. There is an important point I made at the event: Ethereum is the only blockchain with a common continuum between public and private implementation environments. This is significant for the long term because it provides a view of how the real world works. The Internet relies on the same standards and technology whether in the public or private space, and the only difference is in the firewalls and security restrictions. In the long term, the same could be said about Ethereum: the difference will be a firewall. This is a significant advantage that is still lost on many observers, as it will bring a significant advantage to Ethereum in terms of critical mass of supporters and a stronger ecosystem that crossed both consumer and enterprise spaces. Both public and private chain implementations are symbiotic and learn from each other. Despite all the positives around the Enterprise Ethereum Alliance, I noted a couple of negative articles that deserve rebutting. The first one came from Matt Levine at Bloomberg, and the second one was mostly an amplification of the first one, by Izabella Kaminska at the Financial Times. “He’s right. It’s not a revolution. It’s a systems upgrade at best, and at worst a downgrade into a less efficient system which heightens cartelisation forces and introduces all sorts of new collective action and group-think problems to banking and risk management. Both Matt and Izabella are wrong in their assessment of the importance of this initiative, and their commentary is indicative of a partial understanding of the blockchain landscape. To address the first point, this initiative isn’t any different than what Hyperledger or R3 have been doing well for over a year now. This time, it’s about the Ethereum platform. Finally, there is a cohesive communication effort asserting that the Ethereum technology has real enterprise support behind it. The reality is that several enterprises were already working on Ethereum anyways, but no one had put together a concerted effort to display or highlight these efforts publicly. You had to be feet-on-the-ground to hear in every private meeting that almost every bank or large enterprise was working on Ethereum projects. As far as the second point noting that this isn’t a revolution,- well, that is an old observation. We already know that banks have picked and chosen what they like about the blockchain, and rejected what they didn’t like about it (openness, permissionless and publicness, mostly). Banks are comfortable with some parts of the blockchain, but not all of it. Specifically, they like the shared distributed ledger aspects, and the fact that it enables peer to peer transactions between them, with a drastic reduction on intermediaries, custodian banks, transfer agents, and the likes. Those types of projects can keep them busy for the next 10 years, as they shave costs and speed-up processes, and that’s perfectly acceptable. You can’t fault Ethereum for its lack of marketing. What it lacked in marketing, it largely made-up by the strength of its technology and its adoption. With some added marketing muscle and increased public visibility from the Enterprise Ethereum Alliance and its members, Ethereum is starting to show some teeth in the marketplace, and that’s a very good thing.